Put 2 cups whole strawberries, 1 tablespoon sugar, and lemon juice in blender or food processor and puree. In large bowl, combine flours, xanthan gum, ½ cup sugar, baking powder and salt. Make a well in the centre. In small bowl, beat together oil, eggs, milk, vanilla, and ¼ cup of the puree. Pour wet ingredients into the flour mix and stir until just moistened. Add the diced strawberries and lightly stir to combine. Fill muffin cups and bake in 400 degree oven for 15 to 20 minutes, or until tops are browned and toothpick inserted into the middle of a muffin comes out clean. 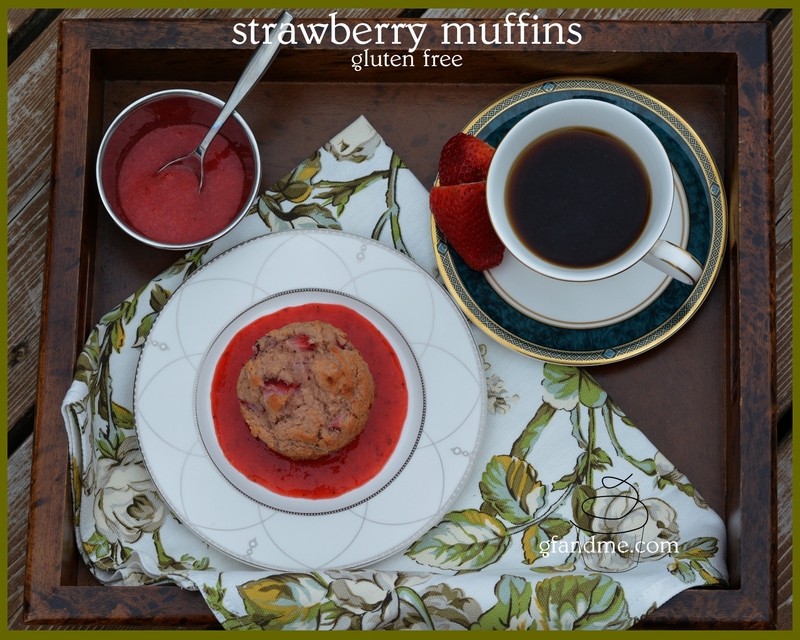 This entry was posted in Baking, Breakfast & Brunch, Recipes and tagged coconut flour, gluten free, muffins, oat flour. Bookmark the permalink. They look so good, good enough to eat!!!! Anything I could use to replace the rice flour? You could try sorghum, teff, or quinoa or a combination of them. Almond meal/flour might work, too. Just add the liquids a bit at a time so you don’t over liquify the batter. If you need more liquid, I would try adding more puree or milk. Good luck. Let me know how it goes! These look soooooo good! 🙂 Can’t wait to try them out!